And more than once, I have resisted the temptation to denounce the questioner. I am old (82 last July), but not that old. However, the truth is that when, in the late 1970s, I had the chance to become The Nation’s editor, I said yes largely because of The Nation’s long and noble history. Even though I grew up in a home where The Nation (along with The New Republic) arrived weekly, my parents found it hard to understand why I would give up what looked like a promising career at The New York Times (where I worked as an editor on the Sunday magazine). The obsession with anti-Communism….became a routine feature of our lives. Witness the sedition prosecutions under the Smith Act, the intimidations of the FBI, the rash of loyalty oaths, the security-screening apparatus which blankets American industry, the emergence of the informer as hero, the wave of deportation and denaturalization proceedings against the foreign-born, the restrictions on the right to travel, the manifold attacks on organizations and on the freedom of association, and the congressional witch hunts. But since, as any reader of The Nation will attest, the evils and grotesque excesses of the anticommunist crusade are an old and oft-told story, why bother to bring them up yet again now? Partly it’s because of a personal experience I recently had involving one of McCarthyism’s lesser-known victims, Jack O’Dell, now in his 90s, which I’ll tell you about in a minute. (We also have an article by O’Dell himself on page 188 of this issue.) But mostly it’s because of the impact of McCarthyism/Hooverism on the rest of us. That impact lives on to this day, despite the end of the Cold War that gave rise to it. Let me explain. After Robert Kennedy was killed during his presidential campaign in 1968, I asked Burke Marshall, who had served as head of the Civil Rights Division in Kennedy’s Justice Department, if I could go through his files for a book I was writing on RFK’s tenure as attorney general. Marshall said I could but that it wouldn’t be of much value, since the Kennedys put little on paper and did everything by word of mouth—and indeed, that turned out to be mostly the case. But one weekend, while the Marshalls were vacationing in the Caribbean, I got snowed in at their place in Bedford Hills, New York—and somewhere around 2:30 in the morning, while going through the papers stored in their attic, I came across a sealed file. During the campaign, Kennedy had been asked on more than one occasion whether he had authorized the wiretapping of Dr. Martin Luther King Jr., and his answer was always the same: he couldn’t discuss individual wiretaps—that information was classified—but he could assure his interrogator that he never authorized any wiretaps except in the area of national security. In the sealed file were a series of memorandums, the first from Hoover asking for permission to tap King’s phone because there were two communists (“planted,” Hoover wrote) in his camp—a New York lawyer named Stanley Levison, and an African-American, Jack O’Dell—and Hoover wanted to see whether they were trying to influence Dr. King and his movement on behalf of the Soviet Union. 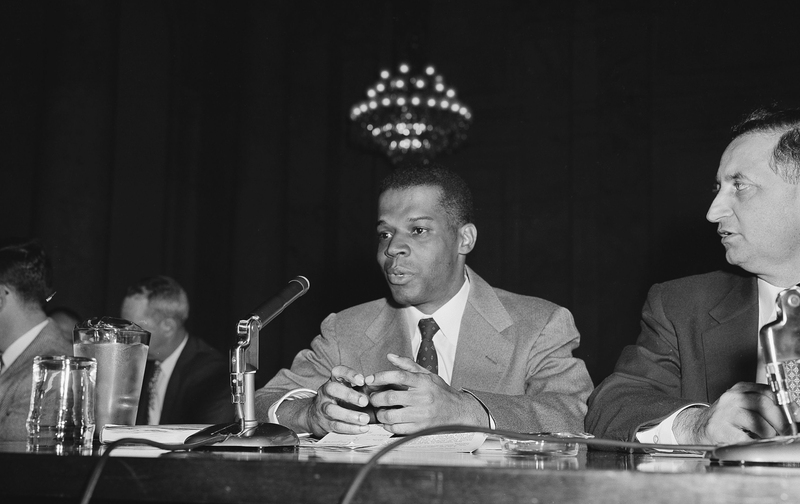 Other memorandums made it clear that the president, the attorney general, Burke Marshall and others—all buying into the prevailing anticommunist assumptions of the day—pressured King to get rid of these two alleged communists, lest their presence be used to smear him and his movement, and compromise the possible passage of civil-rights legislation that was working its way through Congress. I eventually found Levison, who denied party membership, but never found O’Dell; then I wrote it up, and The Atlantic Monthly put the story of the wiretapping of Martin Luther King on its cover. Forty-odd years later, O’Dell, now living in Vancouver, showed up on The Nation’s annual fund-raising cruise, and I got to ask him the $64,000 question: “Are you now or have you ever been a member of the Communist Party?” His answer: “Of course I was. They were the only people doing anything about Jim Crow, lynching, the poll tax.” Asked whether he had any reservations about Stalin, the purge trials and all the rest, he said that he didn’t join the party because of Stalin and he didn’t leave the party because of Stalin. He quit because he thought that civil rights would come before socialism came, and he wanted to be part of the movement to make that happen. Back in the 1950s, as the sociologist Matthew Nichter put it, communism and socialism, in the minds of most Americans, “were roughly on a par with cannibalism and satanism.” But listening to O’Dell now, it occurred to me for the first time what we as a country and a culture had lost by disqualifying this energetic, articulate, charismatic and wise man from making his case in his own name and voice. And I began to consider how stigmatizing people with the red brush had deprived the rest of us of interaction with people whose ideas might have not merely deepened and clarified the national and international conversation, but whose advocacy, intelligence, passion and information might have brought us to an improved understanding of the political and cultural situation, and perhaps even have transformed it. I began to wonder what we had lost by not permitting O’Dell (and other communists and former communists who were not willing to renounce their past) to publicly participate in our politics. Historical counterfactuals never “prove” anything, but before I mention other ways the consequences of our anticommunist obsession continue to bedevil us, indulge me while I cite but one example of how things might have been different had Jack O’Dell and his ideas been accorded the respect, attention, and presumption of possibility accorded members of the establishment and mainstream politicos. Consider his argument that what became the Marshall Plan should have been carried out under the auspices of the United Nations—dismissed at the time as a recycling of the party line. O’Dell favored using the United Nations to supply aid and relief to rebuild Europe after World War II rather than the Marshall Plan, which he saw, rightly or wrongly, as an agency of US imperialism. Henry Wallace had incorporated the idea in his presidential campaign, and it was included in the Progressive Party’s platform. O’Dell believed that Wallace’s call for “the century of the common man” was the best answer to magazine magnate Henry Luce’s claim that this was “the American century.” Many may not agree with O’Dell’s analysis that the Marshall Plan was capitalism’s way of protecting oil and other business interests. But for myself, when I read about how hundreds of men, women and children are being killed in Syria and slaughtered in Libya but we can’t do anything about it for fear of getting involved in “another Iraq” or “another Afghanistan,” I can’t help wondering: Isn’t that what the UN was supposed to be for? Had O’Dell’s position prevailed, and had we built up the United Nations as part of a general effort to honor the ideal of an international agency, would the UN be in a better place—not to mention the world? We can’t know the answer to that question, but if the UN is indeed our last, best hope for addressing the staggering array of global problems that confront the planet, it’s an important one to ask. As it happens, I agree with O’Dell’s analysis, but my point here has nothing to do with whether he was right or wrong, but rather with the fact that during some critical years in our nation’s history, this man—who at age 89 received the only standing ovation in seventeen years of Nation cruises—was not permitted to participate as himself, under his own name, in this country’s political conversation. What we have lost by depriving ourselves of the expanded dialogue that O’Dell and others like him might have made possible is incalculable. § Vietnam. Take the Vietnam War itself. Purging the State Department of the China hands (men like John Stewart Service, John Paton Davies, Oliver Edmund Clubb)—essentially because they were right in predicting that communism would come to China—meant that there was no one around to file dissenting cables when the decision was taken to follow the French into Vietnam. In addition to blood and treasure, the costs of that decision in terms of enemies and critics alone are still with us and impossible to measure. § The Central Intelligence Agency. Never mind the congressional report on CIA torture. The agency, founded in 1947, was from the outset more a covert-action arm than the research institute that its name would imply. As Tom Hayden has written recently for The Nation, “It’s relevant today…because of the cancerous growth of Big Brother surveillance and the proliferation of clandestine operations branded in the name of ‘democracy promotion,’ from Cuba to the Ukraine.” The pervasive use of secret-money campaigns makes it impossible to know whether operatives of our intelligence agencies have any role in harassing or steering social movements, or whether such roles have been passed on to private foundations. Democracy is increasingly in the dark. According to Hayden, differences have “blurred” between the CIA and the US Agency for International Development, which spends an annual $20 million on “democracy promotion” in Cuba. The CIA continues to meddle in Ukraine and even played a role way back when in the arrest of Nelson Mandela. Such practices, Hayden notes, cast a long shadow that is still with us. § Pre-empting class analysis. I would further argue that the conflation of Marxism with the former Soviet Union and domestic subversion, so characteristic of the Cold War years, has had the side effect of stigmatizing anything that smacked of class analysis. As a result, for years Americans were deprived of some of the most relevant and probing analysis—and even identification—of our core economic problems. To a great extent, this is still true, although occasionally the mention of class seeps through. Thus a recent New York Times column made the connection between class and the environment, pointing out that even though the benefits of pollution control are more or less evenly spread across the population, environmentalism is a class issue. For example, ownership of stock in coal companies is concentrated in the hands of the wealthy, with all that this implies. How to calculate the consequences of the books not written, the scientific discoveries not pursued, a trade-union movement purged of its most energetic, creative and effective leaders (demonized as Communists and fellow travelers)? All that is only part of the legacy of what David Caute has aptly called “the great fear.” In her sophisticated study Many Are the Crimes: McCarthyism in America, historian Ellen Schrecker does a fine job of showing how the Taft-Hartley Act (1947), passed as an anticommunist measure, undermined all of organized labor. The crippled labor movement helps to explain as much as anything the increased inequality that Thomas Piketty has newly brought to our attention. But the legacy of a labor movement purged of its best and most radical members is not merely economic. As we know from what has gone before, its impact is also political (particularly where civil rights and liberties, not to mention global freedom itself, are concerned). In other words, McCarthyism/Hooverism may be long gone, but its aftermath is alive and as sick as ever.